The main purpose of writing a persuasive essay is, like the name suggests it, to convince the audience of a certain point. This type of academic writing task is also known as argumentative essay — it is expected that you use sufficient arguments to defend your position. But what is persuasive essay writing exactly? How to nail it by making your reader take your side of the argument? How to write a persuasive essay and how to end it? What are the secrets of making your opponent believe you and winning the argument? Read on to discover some useful tips, hints, and tactics. Let us start with some steps you should follow when writing an argumentative essay. Choose a topic. It should be contradictory enough, with more than one point of view possible. Moreover, the author is supposed to select the topic that is dear to their heart to enjoy the process of writing later. Ensure that your topic is something specific. For example, the topics “Does Facebook Cause Isolation and How?” or “Are Security Cameras Invading Our Privacy?” are a great choice for those who are searching for something that’s not super broad. Remember, in case your stance on the issue can be easily boiled down to a simple “no/yes”, then, you won’t have too much talk on the topic. So, it’s better to choose a specific statement to disclose. Choose the side you are on. Now, your task is to choose your perspective and convince the reader of its legitimacy and logical supremacy as compared to other points of view. For instance, if your topic sounds like “Should Citizens Be Provided with the Right to Keep Exotic Pets?” you have to decide whether it’s their right to keep such animals at home or such pets create a serious danger to other individuals (let alone, keeping such pets is harmful to the animals!). Make certain that you can defend your position. In case you find it hard to consider any solid defenses against the opponent’s counter arguments, maybe it’s the right moment to re-think the topic you’ve picked. Pick an argument to appeal to human emotions. Thus, you will give your audience a chance to connect with what you’re saying. The reality is that people argue rationally quite rarely, which means that making them dive emotionally into your viewpoint is the amazing way to change their mind. Without a doubt, you’ll have to provide rational arguments in your argumentative essay, but things will be tough in case you introduce the topic that never arouses any feelings. Picture your audience. Which side of the argument are they on? What do you presume, will they agree or disagree with your perspective, or will they be indifferent or indecisive? You will need this information to understand how strong your evidence should be. Do a thorough research. Find robust evidence that supports your position. It might be facts, logical arguments, or statements from experts. Sometimes, inserting fragments of your personal experience can be helpful. Think about the objections your reader might raise. When elaborating a persuasive essay, you should try to overrule them with stronger evidence. Anticipate their counter-arguments and rebut them in advance. Organize your evidence. You should order it in the most persuasive way, usually by presenting the strongest arguments in the end, in order to rid your reader of any doubts. These are some general steps; without them, you simply won’t write a persuasive essay. Still, if you want your paper to hit the bulls-eye and change the way your reader thinks, you need a few tactics. Below, we’ll share with you some tips on how to make argumentative essay most convincing. Before you start working on your essay, you should consider drafting its structure first. If you are wondering how to write an argumentative essay outline, then it’s no different from any other essay outline. Just remember that the body paragraphs should correspond with your key arguments. 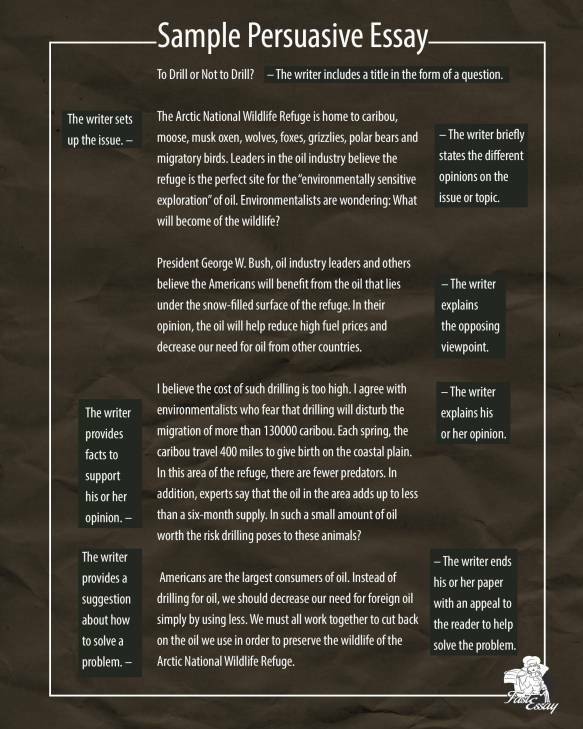 For example, when you have a classic 5-paragraph essay, make sure that paragraphs 2, 3, and 4 dwell on an argument each. What’s more, consider tackling a possible counterargument in the third paragraph, in order to make your rationale more convincing. You must be aware of not just your side of the argument, but also the one of your opponent. Acknowledgment of the opposing views is called concession. It allows you to win your argument more gracefully by first discovering the common ground with the opponent. Find out what kind of evidence they might use, what data they might operate, or what information they might appeal to. Then refute those with even stronger arguments. You might even mention the actual counter-arguments before confusing them. Importantly, you should think about how to write argumentative essay introduction and make it effective. We advise you to start your opening paragraph with a hook, an attention-grabber for your reader. You can insert a quote here, introduce a curious fact or draw some stats, or construct a vivid situation. Your hook is the very first sentence that can help you convince your audience. As long as it draws your reader in, you’ve done your job! For instance, feel free to start your persuasive essay on the necessity of entering college like this: “There are individuals, who have never been to college and are doing better than those with a degree.” This simple statement tells nothing special at all. However, it encourages your readers to keep on reading in order to find out why things are like that. Do you feel like you can’t come up with a hook at the moment? Proceed to the next writing steps! You can always come back to this part later even after you’ve accomplished your project. tell your readers how you are going to do that (e.g., by providing some factual evidence). Don’t forget about a transition to the body part of the essay. Every ‘body’ paragraph should be solidly focused on a single evidence. Make sure to include references and facts to support each of your claims. Use the so-called rule of thumb: every time you make a claim that isn’t a typical one for the subject, support it. One of the best ways to cope with it lies in reverse. Make sure your evidence leads you and your readers to your arguments. However, if you support it with solid evidence, it won’t be pointless. Just like in your research paper, dissertation or speech writing, challenging your audience is always a good idea! According to the basics of the persuasive essay writing, the author of the paper shouldn’t be confrontational. However, you need to force your audience to re-evaluate their points of view. 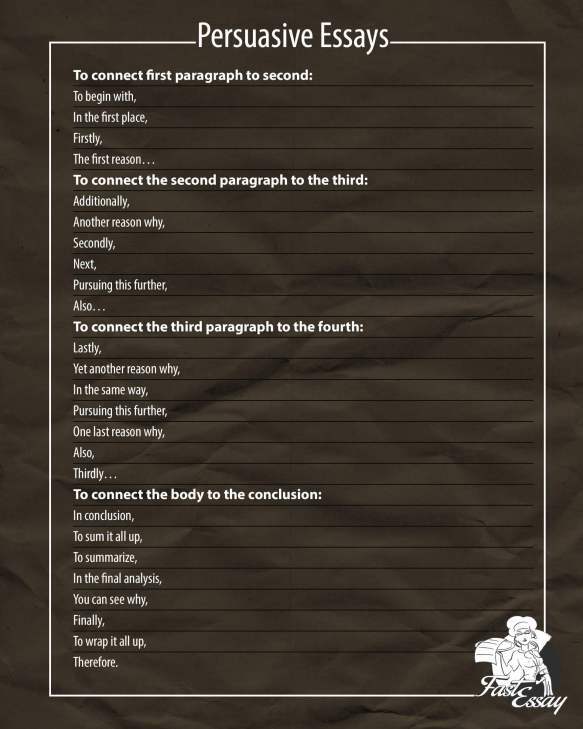 At a minimum, generate 3 ‘body’ paragraphs to justify your points and provide your evidence. Check how all the paragraphs flow together. It is important to ensure the persuasive essay points are naturally presented one after another, rather than scattered all over the text. So, we’ve given you a few tips on how to write persuasive essay introduction and what to remember about in your body paragraphs. Now, let’s get to the final point — how to end the persuasive essay. The main tips for closing your argumentative essay are to rephrase your thesis statement or summarize your main points (in this case, your key arguments). Then, to spice it all up, put your central statement in the broader context. Let your final sentence make the reader wonder, “what’s next?” They will surely want to know where they can go from here or how they can make use of their new point of view. A call for action, a recommendation, or just an open question might provide them with a hint. Take a day or two off. Let your essay sit and your mind rest. Then, read your persuasive essay with fresh eyes. Ask yourself if your essay is logical and convincing. OK, you’ve completed your persuasive essay, and the time for an effective revision has come. When you revise your essay, you have to ensure its organization is absolutely appropriate to your target audience, the paper context, and the purpose. Remember, the message of your essay will be both more controversial and effective if your project connects with the target audience, serves the specified purpose as well as explains the intended context to your readers. To make sure your writing is of the good quality, overlook this our step by step guide on how to perform a thorough revision of your assignment. Start by reading your project to yourself paragraph after paragraph. Do that out loud to make certain your persuasive essay says what you have planned to say. Pay due attention to the way you use various types of sentences, how you choose the right words for the text as well as how you tend to express what’s on your mind. Do not hesitate to change what you feel should be changed. Feel free to switch the sentences location or order, add or erase words and ideas, or fix anything else in a paper structure or its context to make it better and more concise. Use the word counter to ensure your essay meets all the college requirements. Then, approach your college mates and ask them to check your work to give you a fresh viewpoint about your writing. Listen to what they say and consider their tips to write a good persuasive paper. Do the introduction, the body, and the concluding part of the essay include a clearly presented main idea with strong facts, explanations or/and details? Do you, as the writer, provide a consistent viewpoint, focus, and organizational outline, including the proper paragraphing? Have you successfully proved a clear understanding of the core purpose? Did you use various types of sentences? Does your content include any language errors – spelling, punctuation or grammar ones? Have you removed every error that wouldn’t let your audience understand the text? Summing it up, the “how to write argumentative essay effectively” formula is simple: present your point of view on a controversial topic, support your arguments with strong evidence, and always keep your opponents in mind. In this article, we have walked you through the essential steps in writing an argumentative essay and prepared some tips for each part of your piece. Now it’s your turn to use all of these in practice and craft a powerful persuasive text.